[Kenneth Finnegan’s] latest clock makes use of the TI Launchpad for programming and debugging MSP430 microprocessors. We took a look at the Launchpad when it was released and we’re glad to see some hacks resulting from availability of that tool. The clock reads out the time using a bi-color LED. Press the button and a series of flashes will tell you the time. A three-position toggle switch is used along with the push button for setting the time. The protocol he developed is outlined in his demo video after the break. 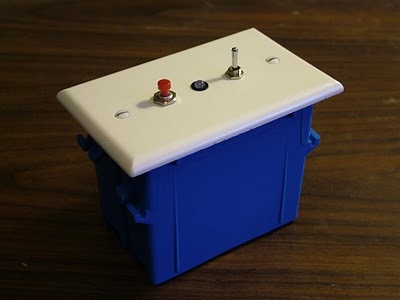 We like [Kenneth’s] use of a plastic electrical box as a project box. They’re cheap and you can find them everywhere in many different sizes. He mentions the difficulty in drilling through the faceplate. We’ve had our share of shattered plastic trying to drill holes in the darn things. If you’ve got some tips on faceplate-modification we’d love to hear them. This clock is sure the polar opposite from the TTL clock that [Kenneth] showed us back in March, trading jumper wires for lines of code. We’re going to give this one a try, hopefully fixing the button debounce along the way. What we need in today’s handhelds is LESS resolution. Take a look at the video after the break to see the exciting action that [Bruno Pasquini] 4×4 LED matrix handheld game delivers. 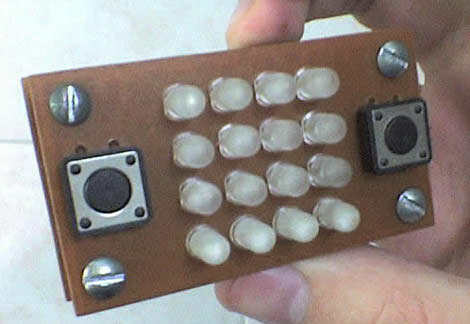 The device is made up of 16 bi-color LEDs, four buttons, and a PIC 16F628. There’s no schematic yet but it looks like there’s no need for shift registers, just some transistors to handle the current load for the rows of each color. We’ve seen a 64-pixel handheld that plays Super Mario Brothers, but this portable brings a top scrolling racing game with just 25% of that display size.